The pit lane drag strip roared to life last Friday night as the 2018 O'Reilly Auto Parts Friday Night Drags kicked off its 12th season at Atlanta Motor Speedway. A full field of drivers was anchored by the seasoned veterans of the series. A healthy mix of newcomers showed flashes of brilliance and helped elevate the competition. Last week, drivers got their first taste of the fierce competition expected throughout the 2018 season of Friday Night Drags. Week two action is expected to be no different with the new cars competing alongside the mainstays in each division in heated battles to take home the hardware every Friday night. "We will have a lot of good cars racing this season," said Griffin's Lamar Chambers. "Everybody has been working on their cars over the off season so I think they are in for a surprise on some of them." Racing weekly at Friday Night Drags for the past dozen years, Chambers knows the competition will be tight throughout the season as he didn't make it out of the first round Friday in the Summit Racing Equipment Sportsman Class. Vincent Varela of Jonesboro, a newcomer to the class, did advance to the semi-finals but could not get past regulars David Waksman of Sharpsburg and Senoia's Chase Ponder. It was Waksman who prevailed in the final. Donnie Henderson of Hampton earned the final round victory in the Harding, Plumbing, Heating and Cooling Domestic Class on Friday. He sized-up the competition and the new vehicles in the field including the yellow 1982 Chevrolet S10 of Douglas Roberts of Stockbridge to earn the win. A regular at Friday Night Drags, Doug Ragan of Williamson unveiled a new Pro Class car on opening night. Ragan still has work to do on his 1993 Pontiac Firebird to challenge Friday's final round winner of Kevin Mayo and the 1969 Chevrolet II Nova. Ragan was eliminated in the opening round. A long time spectator, Brian Fisher of Senoia brought out his 1964 Chevrolet Malibu for the first time on Friday night in the Street Performer Class. "We got the car ready and tuned it in the best we could," said Fisher prior to eliminations on Friday. "We came out here and did some test and tune to get ready." Eliminated in the semi-finals, Fisher will need to make more adjustments this Friday night in the final tune-up opportunity before the points season begins on June 1. "The fans are going to see some fast cars and good competition in all classes," said Fisher. "They'll have a really good time at Friday Night Drags." 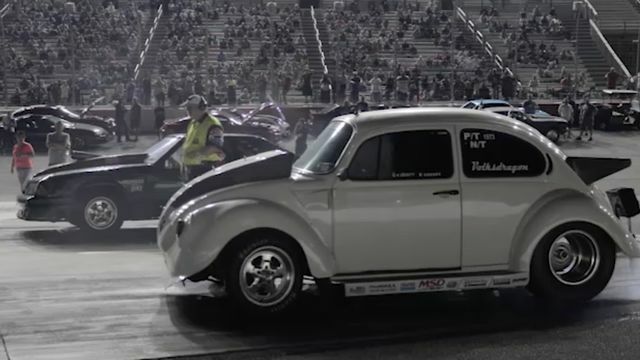 Atlanta Motor Speedway's popular street-style drag racing series, O'Reilly Auto Parts Friday Night Drags, continues this Friday night with week two action of high-intensity, side-by-side competition on the famed pit-lane drag strip.